We’d love your help. Let us know what’s wrong with this preview of A Year of Living Your Yoga by Judith Hanson Lasater. To ask other readers questions about A Year of Living Your Yoga, please sign up. I keep this lovely book by my bed as a reminder that my yoga practice is about more than being able to a headstand. Which I can’t do and, frankly, don’t care about doing. So much wisdom inside its cover. Among the top ten on yoga inspired books to read. I read this every morning. 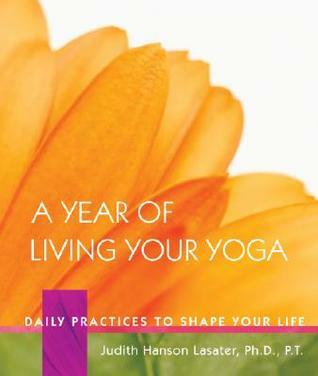 In this book, Judith Lassiter offers daily meditations and thoughts to structure practice in and off the mat. I’ve been working with this book for a few years. I’ve shared the meditations in this book with friends and coworkers as they sometimes are helpful for a situation or inspiring for a birthday or other auspicious times and events. I feel like this is one tool I use to anchor myself and I look forward to the gifts I find within the pages. This book wasn't quite what I was expecting, but it was actually really nice, like a 'day' calendar where there's a thought, insight and even an 'action' for every day of the year. No images of people doing asanas or anything, but some really nice insights and thoughts. Yogis. Non-yogis. Everyone should have this book in their home to go back to throughout life! Wonderful perspectives and affirmations! Loved this little book. Returning to it often! This book is pretty cool. It gives you an intention for the day and it is very mindful. I do believe I will be buying this one and using it throughout many years. This is a gem that you can refer to on a daily basis. I am a Judith Lasater fan. In July I attended her Restorative Poses teacher training in San Francisco. She is a remarkable yoga teacher and a wonderful, intuitive, wise person. This book has a thought for each day of the year. Whatever you do, do it with an open heart. LIVING YOUR YOGA: Maybe you agreed to do something but now you are wishing you hadn’t. If you do choose to follow through in the end, do so wi This is a gem that you can refer to on a daily basis. I am a Judith Lasater fan. In July I attended her Restorative Poses teacher training in San Francisco. She is a remarkable yoga teacher and a wonderful, intuitive, wise person. This book has a thought for each day of the year. LIVING YOUR YOGA: Maybe you agreed to do something but now you are wishing you hadn’t. If you do choose to follow through in the end, do so with willingness and interest. You will suffer less and so will the others around you. LIVING YOUR YOGA: fighting with something makes it stronger. Today when you want to push something away, instead just sit down, close your eyes, and for five minutes imagine yourself as a large container holding your own resistance. The resistance may remain but you are fighting it no longer. This is freedom. I love my stack of “snippet” books. This is truly one of the delights of retirement: as I enjoy my fruit plate each morning, I indulge in these sweet mental stimuli - reading a thought, a few poems, reviewing a page in a language workbook, etc. My current stack includes: Louise L Hay’s Wisdom Cards, A Year of Living Your Yoga, The Essential Rumi, The Collected Poems of Langston Hughes, and Equipe 3 (a French workbook). I try not to be rigid about this, of course, because that would spoil the fun, but I do look forward to my daily samplings. A lovely book – highly recommended! A good book to read a day at a time throughout the year if you are looking for a very short morning read. Personally, I am finding Mark Nepo/s The Book of Awakening: Having the Life You Want by Being Present to the Life You Have a deeper, but longer daily read. A wonderful collection of daily reminders to breathe, relax, and appreciate the important things in life. Yoga practitioners will enjoy keeping this one on their nightstands and teachers will enjoy sharing the words of wisdom with their students in class. Lasater truly knows what it means to 'live' yoga. 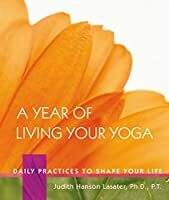 The book provides a yoga-related thought or focus for each day of the year which although a lovely idea, I found there were just too many days where I read the entry but was too busy or preoccupied to consciously apply it throughout the day. I'm not quite finished with this yet (as it has a daily devotional), but I am really enjoying it. At least once a day I try to meditate and often I will reflect back on what I read that morning to get me started. Its very uplifting and I really enjoy where its taken me. This is a great daily inspiration book concerning yoga. Already, just using it for the last week, it helped set a meditative tone to my day and give me something to focus on either in my practice or my daily life. I'm looking forward to the rest of the year. I just got this book today and read half already even though its supposed to take a year. It is not so much a yoga book as a life book..how to make each day better by changing our attitude and our response to external factors. Lovely little inspirational thoughts for each day. Perfect for even the busiest of mornings. A A great find in Blossoms Bookstore in Bangalore. A great thing to place on your altar; you have a reflection for every single day to ponder. Wonderful quips to keep you going throughout the day/s. One that I will come back to again, I'm sure. Read long ago and picked back up again about two years ago to read again. It's very good. Insightful. Delight to read.